Muriatic Acid, also known as Hydrochloric Acid, is used in a broad range of applications; the largest of those end uses being related to steel pickling, well acidizing, food manufacturing, the processing of ore, and the production of calcium chloride. It’s also commonly used in oil well acidizing to remove rust, scale and other undesirable carbonate deposits—this helps the crude oil and or gas flow through the well. Although the average person may not think of HCL often, its presence in the manufacturing of finished products we consume in some form or another is somewhat astonishing—high fructose corn syrup, hydrolyzed vegetable proteins, gelatins, or as an acid modifier in many sauces. 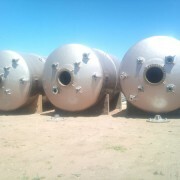 The two most common materials of construction used to process, store and handle Hydrochloric Acid are rubber-lined steel tanks or Fiber Reinforced Polymer (FRP) tanks. There are obvious trade-offs with either choice; rubber-lined steel tanks tend to be more expensive and are susceptible to corrosion. However, rubber-lined steel tanks are frequently used when tank damage (e.g. 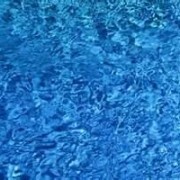 puncture or tear) is a concern. On the other hand FRP, when designed and executed properly, is corrosion resistant, has a high strength-to-weight ratio, long life cycles, low maintenance costs, and excellent dimensional stability. As with any custom fabricated material, such as FRP, it is critical to ensure that design meets key requirements and specifications for the environment. For example, the effectiveness of FRP to resist corrosion is dependent upon a properly specified resin selection, laminate schedule, and corrosion barrier—among much else. One highly sensitive are that will want to be addressed when utilizing FRP materials to store HCL is to ensure proper venting and vacuum design specifications have been met. 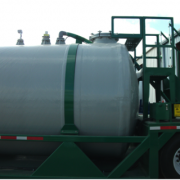 One common problem in the industry is that FRP tanks are not always properly designed to meet pressure and vacuum conditions—an especially important factor when HCL is loaded/unloaded using air pressure. 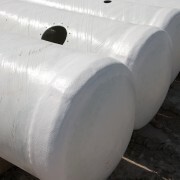 It is important that all storage tank materials be designed to handle air surges and the displacement of air during these loading and transfer applications. Beetle Plastics should be consulted to determine proper design of the pressure relieve system including venting and openings. Hydrochloric acid is extremely corrosive to metals including many that are common materials of construction the world over. Carbon steel, stainless steel, nickel, bronze, copper and aluminum are all extremely susceptible to corrosion. FRP materials that are constructed to withstand harsh chemical environments, such as HCL, are specially designed to leverage the chemically resistant properties of resins that are structurally reinforced with glass fibers during the fabrications process. FRP is an ideal solution not just because of its corrosion resistance, but also because of its versatility. 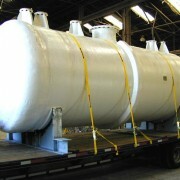 FRP custom tanks, pipes, or vessels can come in a wide variety of sizes from ½” to 14’ in diameter. Also, custom FRP corrosion resistant piping is lightweight when compared to other materials and can be fine-tuned to fit tanker trucks and detailed to meet specific aesthetic requirements. The high quality, durability, strength, corrosion resistance, and customization all make FRP an ideal solution for the challenges associated with HCL.